<p><b><i>This package includes a three-hole punched, loose-leaf edition of ISBN 9781119330103 and a registration code for the WileyPLUS course associated with the text. Before you purchase, check with your instructor or review your course syllabus to ensure that your instructor requires WileyPLUS. </i></b><br /> <br /><b><i> For customer technical support, please visit http://www.wileyplus.com/support. WileyPLUS registration cards are only included with new products. 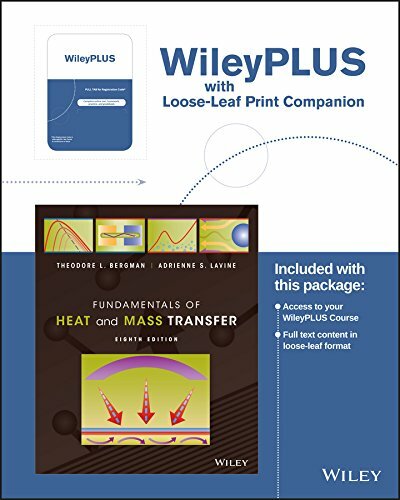 Used and rental products may not include WileyPLUS registration cards.</i> </b></p> <b><i>Fundamentals of Heat and Mass Transfer, 8th Edition </i></b>has been the gold standard of heat transfer pedagogy for many decades, with a commitment to continuous improvement by four authors&#x2019; with more than 150 years of combined experience in heat transfer education, research and practice. Applying the rigorous and systematic problem-solving methodology that this text pioneered an abundance of examples and problems reveal the richness and beauty of the discipline. This edition makes heat and mass transfer more approachable by giving additional emphasis to fundamental concepts, while highlighting the relevance of two of today&#x2019;s most critical issues: energy and the environment.